← Explosion of Blog Aggregators…How to Keep Up? The average StumbleUpon visitors stay a few seconds on the site and then leave having visited one page. That’s exactly how I use the StumbleUpon toolbar, clicking the Stumble! button quickly unless a site particularly grabs my interest immediately. Traffic Growth #5 – What Value In StumbleUpon Visitors? Robin’s observation probably rings true for most bloggers. Sites like StumbleUpon and Digg can drive significant traffic to a site. If ad impressions or clicks are important to a blog, then those visitors might have value. If your goal is to build an audience with whom you mutually learn and build relationships, those sites aren’t worth much. Traffic from StumbleUpon and Digg is like loading up on empty calories. They fill you up for a while, but they have no nutritional value and leave you hungry for more soon thereafter. FriendFeed, on the other hand, lets bloggers build a solid foundation of long-term readers who in turn serve as the best sources of new readers. 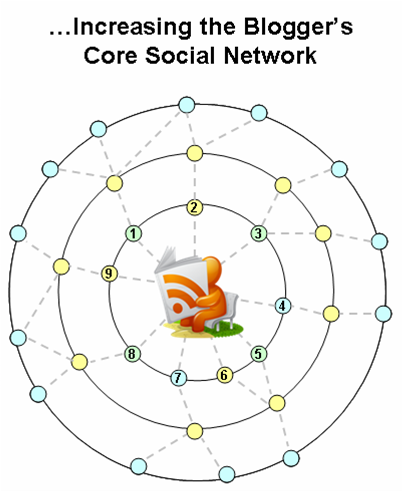 FriendFeed enables trusted referrals at two levels of a blogger’s social networks. The first level are those people who subsribe to the blogger’s feed. They’ll be the first to see new content. These members may then comment, share or bookmark the new blog post. With this FriendFeed feature, your blog is reaching people who do not subscribe to you. In the example above, I’m seeing Rex Hammock’s blog post because he’s a friend of Robert Scoble. A crucial thing to notice though…I only see Rex’s blog post because our mutual friend Robert ‘liked’ the post. His action is the key that makes this feature pop up. In other words, you’re not just bludgeoned with a huge flow of unfiltered feeds in the friend-of-friend feature. I personally have used the friend-of-friend many times to follow new people I didn’t know. I have moved from being a second-degree member of the bloggers’ social network to a first degree member (i.e. a subscriber). This is a powerful feature of FriendFeed, both for bloggers to gain new readers and for members to discover new content. The new subscribers become the source of additional readers through their social networks. A new blog post comes out, and their friends will see it, bringing new subscribers. And so it goes, on and on. With enough time, a blogger will have a terrific base of people that enjoy discussing similar topics. Contrast the slow-building, strong ties forged in FriendFeed to the fast, drive-by traffic coming from StumbleUpon and Digg. Sure, the traffic is great. But you likely won’t see those readers again. With StumbleUpon, many of those visitors are just clicking their ‘Stumble!’ button. With Digg, the blog serves as content for a community that exists entirely outside of the blogger’s social graph. So the blog post gets its moment in the sun with the Digg community, which then moves on to other content. FriendFeed makes it easier for a blogger to build readership than did previous options. I also have a suspicion that exposure via FriendFeed makes it easier for smaller bloggers to make it onto Techmeme. What do you think? 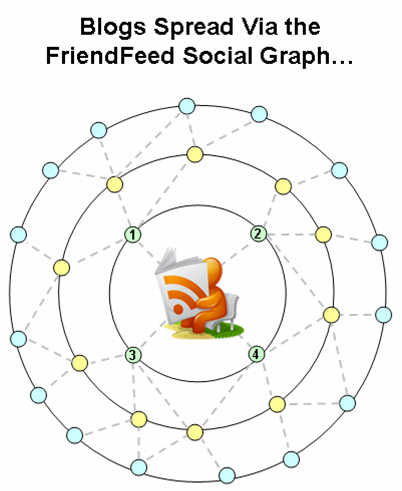 Is FriendFeed becoming the true social graph of bloggers and their readers? Perhaps I’ve missed it, but I haven’t seen a lot of people talk about the friends of friends feature, other than one person who wanted to turn it off. I’m a member of LinkedIn, and they emphasize the reach of their network by printing statistics for your connections, your connections’ connections, etc. I don’t know if it’s computationally possible for FriendFeed to tell you how many friends of friends that you have (in real time, without double-counting friends), but it would be nice if they could. And I just shared this back out to the World Wide Talk Show, which should increase its visibility once again, repeating the cycle! I think that’s a really excellent overview. I agree that the friend of a friend functionality is probably the most attractive aspect of FriendFeed. I’m still in the early stages of using FriendFeed in general, but that’s been invaluable in terms of letting me develop my network of subscriptions and interests, and finding new people who are worth following. You also hit on a point worth deeper examination I think, which is the general difference between the slow build of strong ties and the quick fix of drive by traffic. Even for a service that provides drive by traffic spikes such as StumbleUpon, the real value is in your fans/followers. You’re providing value to them and they are more likely to develop value for you. Excellent comparison. I have started to notice the same thing as well. StumbleUpon is actually much better than digg, but FF is much better than StumbleUpon for sustained traffic. However, a Louis Gray or Robert Scoble share/recommendation outweighs all of them. Great piece, totally agreed. You may actually be spot on with the 10 > 1000 equation ! I love the friend-of-friend feature on friendfeed, by the way. @Ontario – the friend of friends feature is quite powerful, and it does not get a lot of coverage, does it? I like your idea of a LinkedIn type of graph. It’d be really interesting to see that for a given item, or for the blogger overall. @Robert – thanks Robert. You’ve got that 50,000 watt blow torch for distributing things you like. I like the emerging coverage you’re giving FriendFeed. I would just add that, although I love FriendFeed, I would not be surprised to see, as FF gets more popular, it too is overrun by silly people and spammers, to where its traffic sent is huge but equally as useless. These social sites go through a lifecycle of usefulness to pointlessness on their own. interesting concept, will try to use this! @Robin – I think the friend-of-friend aspect has been relatively undercovered so far. But it is quite powerful. And, hey, I liked your piece over at Sarah Perez’s blog today. Looking forward to reading more of your blog. @Rob – interesting to hear your take on Digg versus StumbleUpon. That’s a subtlety of which I wasn’t aware. And yes, getting LouisGrayCrunched is best of all, ain’t it? @Eric – professionals who study these things would love to have a sense of the ratio for traffic to readership, wouldn’t they? I’ll bet someone does a study of this one day. @Webomatica – spam does seem to become a problem, although these new generation social networks seem to be better about handling it. Facebook “spam” isn’t marketer spam (except what Facebook allows), it’s friends’ activities spam. FriendFeed seems to be a good vehicle for controlling it. I wouldn’t subscribe to a spammy member, and if someone kept ‘liking’ spammy updates, I’d unsubscribe from them too. @jeroendemiranda – Glad you like it. What a great observation! I’m kinda shocked that it hadn’t occurred to me sooner. I have noticed that I spend a lot more time reading links from FF (and even Twitter) than I do in my feed reader. The signal-to-noise ratio is so much better. Interesting. I agree with the concept but not the numbers in the title. @phil.gs – Yeah, it kind of just occurred to me as well. If you’re a new blogger, you struggle to figure out how to find readers. FriendFeed has that viral quality thats been lacking in other apps. And the signal-to-noise ratio is controlled via your own social network. : to whom do you subscribe? What are your friends commenting and liking? @Solacetech – I like the way you’ve put it: (1) Content first. (2) Social network next.. It’s not just about the network. @Alex – the numbers were my gut feeling, nothing scientific. The basis for the ratio is the (1) subscription aspect to a FriendFeed visitor; and (2) the viral nature of these readers. StumbleUpon and Digg are much lower in terms those qualities. I believe Friendfeed has a lot of potential. It is easy, addictive and the sharing is fun.